The pathogenesis of acne or how acne forms includes a combination of factors affecting the integrity of the hair follicle and its oil producing gland, the sebaceous gland. The study of how acne develops is a fascinating one. There are many points to be clarified regarding the pathogenesis of acne. What is the basic cause of acne? Why does it appear only on some parts of the body? Why does acne have a course with waxing and waning? 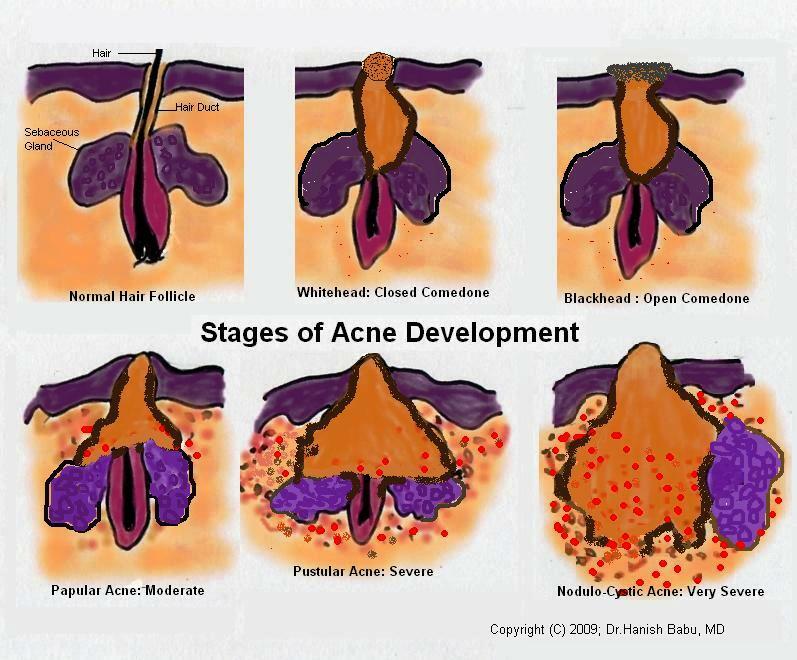 What is the role of hormones, skin oiliness and germs in the development of acne? Inflammation of the pilosebaceous unit. Pilosebaceous unit includes the hair follicle and its associated sebaceous gland. Sebum is the oily secretion from the sebaceous gland lying alongside the hair follicle. Sebum is responsible for maintaining the oiliness of the skin and the hair. It keeps the skin supple and smooth. In infancy and childhood, the sebaceous glands are small and inactive. The sebaceous glands enlarge and become active during puberty under the influence of the androgen hormones secreted by the adrenal and gonadal glands. The increased production of sebum, seborrhea, may be genetically programmed; some individuals are more acne prone than others. It is also seen that sebum secretion and sensitivity of the sebaceous glands to the action of androgens vary from follicle to follicle and area to area. This is the reason why acne severity varies between different follicles and hair bearing areas of the body. The increased sebum secretion predisposes to the overgrowth of the bacteria Propionibacterium acnes within the hair follicle and the sebaceous gland. The action of these bacteria on the sebum is thought to produce irritant products like free fatty acids within the hair follicle. These and other chemical mediators known as cytokines are thought to be responsible for the thickening of the hair follicle, plug formation and inflammatory events in acne. The thickening of the hair follicle walls, known as ductal hypercornification, and the keratinous plug formation is the cause for the formation of the comedo, better known as the acne whiteheads and blackheads. Comedo formation is the first stage of development of acne. When the follicular opening is closed with the keratinous plug, it is known as closed comedone or whitehead, and when it is dilated, the open comedone or blackhead. The black color seen in the blackhead is not dirt, but due to the sebum changing color when it comes in contact with the atmospheric oxygen. Inflammation of the hair follicle and the sebaceous glands and the surrounding dermis is the final event in the moderate to severe types of acne. Inflammation results in red, painful and pus filled bumps in acne. 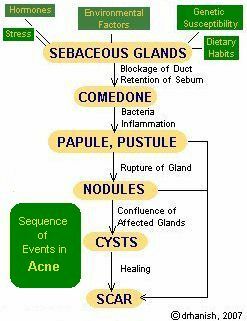 Acne gets inflamed by a combined action of P.acnes, the bye products of the action of the bacteria on the sebum, the corneocytes lining the hair follicle duct and the inflammatory mediators induced by the sebaceous glands. The inflammation weakens the follicular and sebaceous gland walls which rupture to discharge the sebum and part of the comedone into the dermis. This induces a severe foreign body inflammatory reaction resulting in formation of acne cysts and nodules. The inflammatory events in acne precede the hyperkeratinization (thickening of the follicular walls). acnes specifically activate special receptors on the cell membranes of inflammatory cells. The sebaceous gland is a neuroendocrine-inflammatory organ that coordinates and executes a local response to a variety of neuro-endocrinological and stress induced stimuli. Sebaceous gland plays an important role in hormonally induced aging of skin. In addition to their action on sebaceous gland activity, androgens have influence on the follicular cells (corneocytes) also. Oxidized lipids in sebum (possibly altered by P.acnes) induce the production of inflammatory mediators. Sebum contains several matrix metalloproteinases (MMPs) which play important roles in the inflammatory process of acne. The levels of MMPs are significantly reduced in the acne lesions following treatment. The acne information provided above is a short review of how acne develops. The degree of plugging of the comedones and the extent of inflammation decides the severity of the pimples. Different types of acne are categorized according to the severity of the acne lesions. Simpson NB & Cunliffe WJ. Disorders of the Sebaceous Glands in Rook’s Textbook of Dermatology. 2004; 7: 43.1-43.75. Diane T, Gollnick H et al. New insights into the management of acne: An update from the Global Alliance to Improve Outcomes in Acne Group. J Am Acad Dermatol, 2009;60:S1-50.